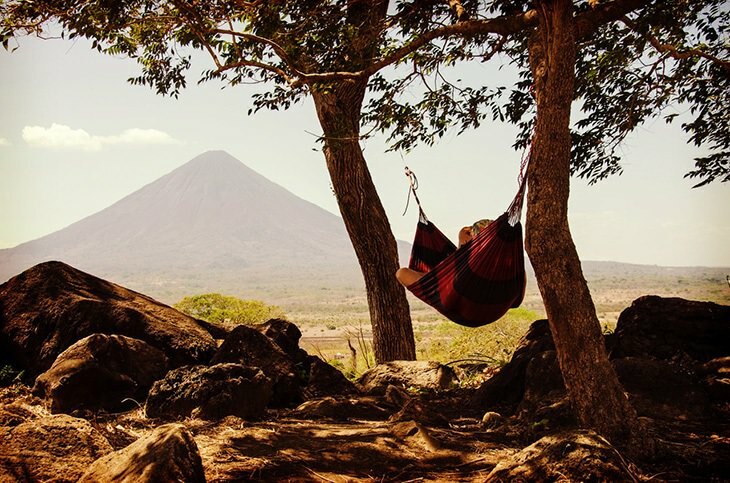 Hammock camping is a completely different animal from ‘normal’ camping, with the main difference being that you do not have a tent. This leaves you exposed to the natural elements such as rain, which could potentially lead to unpleasant, wet, and cold night sleeps. If you are a hammock enthusiast, then I advise you to be smart, think ahead, and get yourself a hammock tarp. Similar to the hammock market, the tarp market is also huge, and it might be problematic to find the right product, so my mission for today is to help you choose the best hammock tarp for you. ENO is a world-renowned hammock and tarp maker that hails from North Carolina. Their DryFly tarp is a light and durable model which might appeal to backpackers. The length of this model is 10 feet 6 inches, and the width is 5 feet 2 inches. This is a pretty decent size which should provide enough coverage for any average-sized hammock. It weighs only 22 ounces, so it is light and easy to carry. 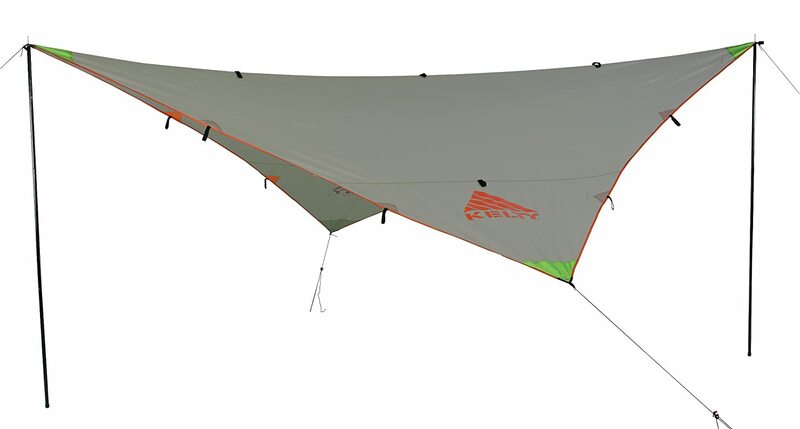 This is a classic tarp that comes to us from Kelty, and it is an interesting product for a few reasons. When talking about size, know that this product is available in three different ones – 9 feet, 12 feet, and 16-feet. It’s very nice to be able to choose a size adequate for your needs. The weights of the three sizes are, respectively 1lb 12oz, 2lbs 4oz, and 3lbs 15oz. The bigger sizes are a bit heavy and bulky to carry, so this might be a problem for backpackers. This tarp is a product of UST, a well-known camping gear maker, and it will provide campers with a feeling of being tucked in. The All Weather Tube tarp is about 7 feet long. This might not provide enough coverage for an average camper, and it is not available in different sizes. The weight of the package is 1lb 7oz which makes it fairly light. Why Buy a Hammock Tarp? 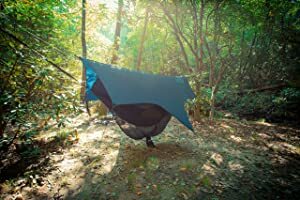 What to Know Before Buying a Hammock Tarp? ENO is a world-renowned hammock and tarp maker that hails from North Carolina. 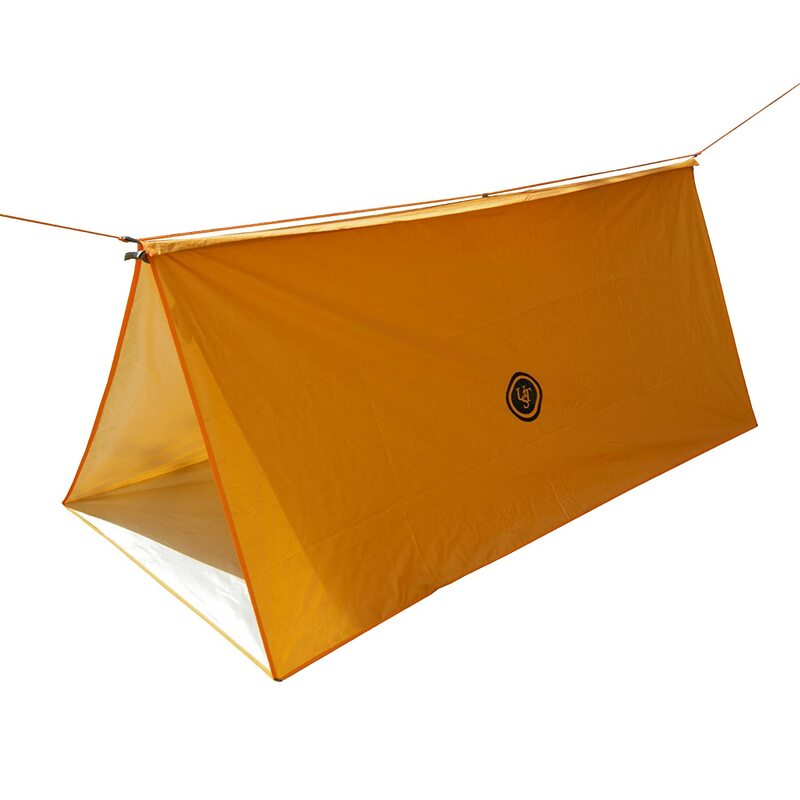 Their DryFly tarp is a light and durable model which might appeal to backpackers. The length of this model is 10 feet 6 inches, and the width is 5 feet 2 inches. This is a pretty decent size which should provide enough coverage for any average-sized hammock. 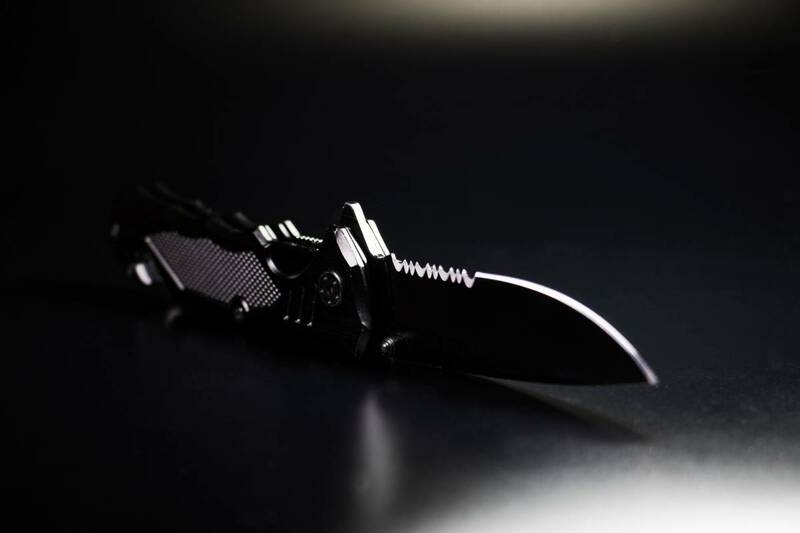 It weighs only 22 ounces, so it is light and easy to carry. The shape is a catenary (cat) cut, and it has eight attachment points in total. 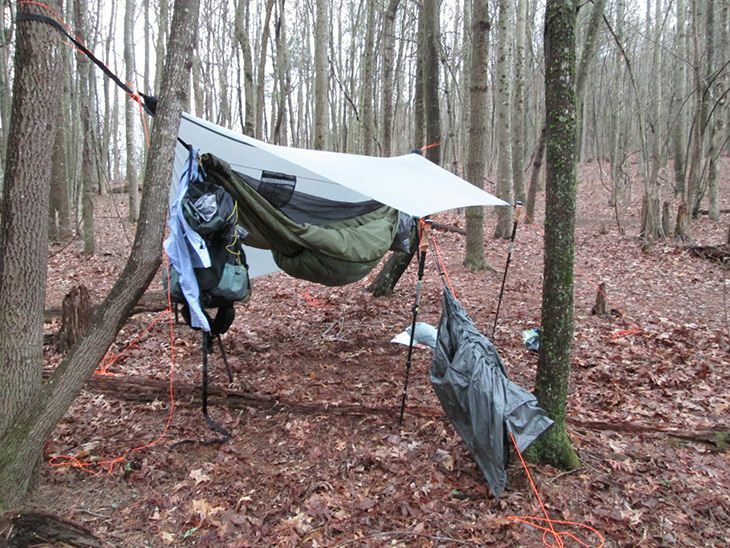 There are two ridgelines at the ends of the tarp which can be tied to trees and will keep the tarp above your hammock. Asides from this, DryFly has six guy lines, three on each side of the tarp. They can be connected to trees, rocks, roots, or staked into the ground. Know that stakes are sold separately, and it would be a good idea to buy them because they are the best way to secure the lines in case of a storm or windy conditions. As far as the material is concerned, this model is made from polyurethane-treated nylon, which does a very good job of shedding water. ENO is a world-renowned hammock and tarp maker that hails from North Carolina. 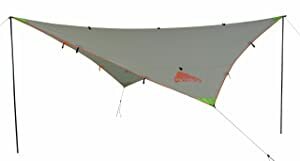 Their DryFly tarp is a light and durable model which might appeal to backpackers.The length of this model is 10 feet 6 inches, and the width is 5 feet 2 inches. This is a pretty decent size which should provide enough coverage for any average-sized hammock. It weighs only 22 ounces, so it is light and easy to carry. This is a classic tarp that comes to us from Kelty, and it is an interesting product for a few reasons. When talking about size, know that this product is available in three different ones – 9 feet, 12 feet, and 16-feet. It’s very nice to be able to choose a size adequate for your needs. The weights of the three sizes are, respectively 1lb 12oz, 2lbs 4oz, and 3lbs 15oz. The bigger sizes are a bit heavy and bulky to carry, so this might be a problem for backpackers. Noah’s tarp has a diamond shape, and it provides very good coverage from the elements. The two basic ridgelines hold the tarp up; they can be connected to trees or held by two trekking poles which can be staked into the ground. The tie-out points of this product are plenty. There are two main guy lines, but you can add more of them since there is a total of 10 attachment points on this tarp. This is a good option to have in case of bad weather. Last but not least, the material of the tarp is coated polyester, and some users complained that it is only moderately waterproof, meaning that it can’t withstand long, heavy rainfall without letting some water through. This is a classic tarp that comes to us from Kelty, and it is an interesting product for a few reasons.When talking about size, know that this product is available in three different ones – 9 feet, 12 feet, and 16-feet. It’s very nice to be able to choose a size adequate for your needs. The weights of the three sizes are, respectively 1lb 12oz, 2lbs 4oz, and 3lbs 15oz. The bigger sizes are a bit heavy and bulky to carry, so this might be a problem for backpackers. This tarp is a product of UST, a well-known camping gear maker, and it will provide campers with a feeling of being tucked in. The All Weather Tube tarp is about 7 feet long. This might not provide enough coverage for an average camper, and it is not available in different sizes. The weight of the package is 1lb 7oz which makes it fairly light. The tarp has a shape of a rectangle and can also be transformed into a tube by using a hidden zipper. A tube shape looks like a three-sided tent, and this is a good option for people who wish to sleep on the ground as it provides protection from the moisture. 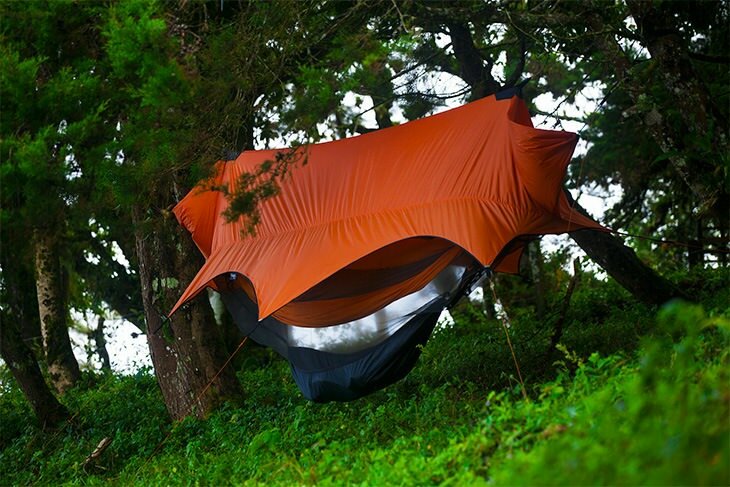 If you wish to use it as a regular tarp, you can attach it to trees with a continuous ridge line. The corners of the tarp can then be secured with guy lines to make sure that it doesn’t move. The tarp’s fabric is strong, durable and resistant to all elements. A nice touch is an aluminized interior which enables good insulation that is much needed during cold nights in the wild. The orange colored exterior is very light-reflective, and it can serve as a signaling surface. 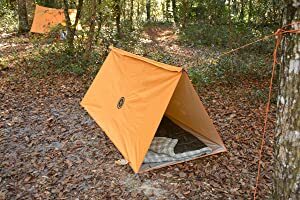 This tarp is a product of UST, a well-known camping gear maker, and it will provide campers with a feeling of being tucked in.The All Weather Tube tarp is about 7 feet long. This might not provide enough coverage for an average camper, and it is not available in different sizes. The weight of the package is 1lb 7oz which makes it fairly light. If you’ve switched to hammock camping, then you already know all the benefits it brings over the tent, so the biggest reason for getting a tarp is ensuring that the weather doesn’t spoil the joys of a hammock. Staying dry and safe from rain is the sole purpose of these products, so there is no reason to think twice about purchasing one. 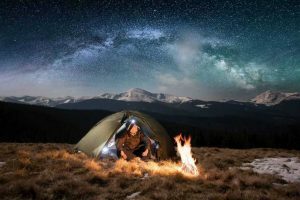 As you already know being wet outdoors is one of the worst things that can happen to you, and a tarp’s purpose is to prevent this from happening and secure your warm, much-needed sleep. The first and the most obvious thing to look out for is proper tarp size. Same as hammocks, tarps come in different dimensions, and you should look for one that is adequate for your hammock’s length. An ideal tarp should extend about 8-inches past each end of the hammock, ensuring that the ends stay dry. This is crucial because if the end gets wet, the water might find its way to the rest of the hammock, which is certainly not desirable. 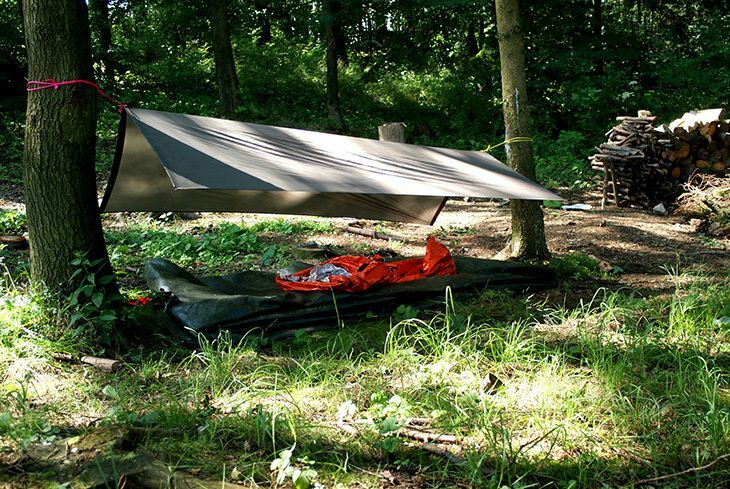 A 10 to 12-foot tarp should be enough for any average-sized hammock. But, know that bigger is not always better when it comes to these products. Larger tarps are heavier to carry and they might impair the airflow around your body, leaving you hot and sweaty. If you’re not expecting rain, go for a smaller size. Tarps come in many shapes, for example rectangular, diamond, catenary, asymmetric, and tarps with full coverage. None of them is ‘the best’ or ‘the worst,’ so this judgment depends only on your preferences. Some provide more, some less coverage, and the factors that you should look at before choosing a shape are the weather and how simple/complicated you want the tarp set up to be. There are two types of tarp ridgelines – end-only lines and full-length lines. End-only ridgelines connect the ends of the tarp to the anchor points, and they slightly cut down on the overall weight of the package. Full-length lines run under the entire tarp and then connect to the anchor points. This type provides a bit more stability and support in windy conditions. This is the other type of lines that are required to set up a tart because they anchor it down towards the ground. Guy line numbers can go from as little as two to six lines (4 season tarp), and they are secured by staking them into the ground. If you are facing bad weather, you can use them to lower the tarp and make good coverage for yourself. Materials from which tarps are made of can vary regarding performance, weight, and how much space they take up. If you’re car camping then a sturdy, heavy material shouldn’t be a problem, but if you’re backpacking that the latter is out of the question. Polyethylene is one of the heavier materials, so people who want to go light should opt for silnylon or similar fabric. 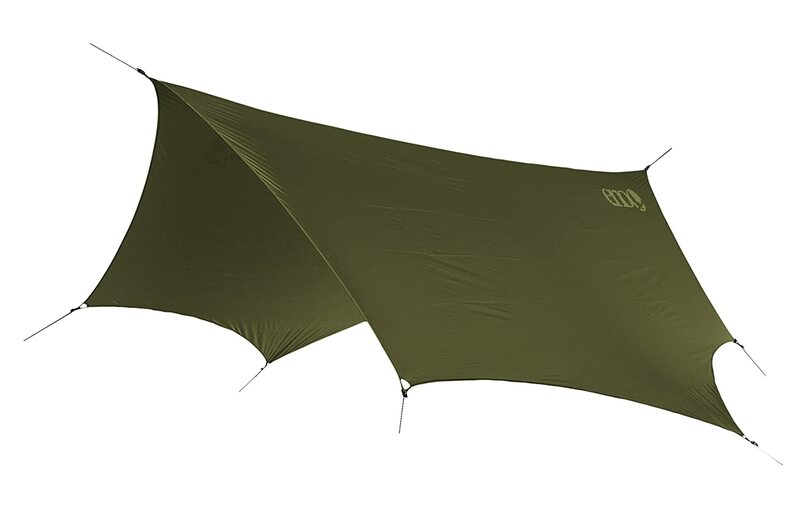 Hot or cold, rain or shine, hammock camping is certainly a wonderful thing, as long as you have a good tarp to protect you.Since it is time to pick a winner, I have chosen the ENO DryFly as my personal favorite from today’s list. My main reason for picking this one is the material it’s made of and its great water-shedding abilities. It will keep you dry no matter how strong the rain is. The DryFly is big enough to provide good coverage but small and light enough to be easy to carry along with you. Also, when properly set-up, it can withstand storms and strong winds without any problem. However, do not take my choice as the ultimate solution. My advice to you is to try out more models, think about the conditions you will be facing and then decide for yourself.